This is probably the biggest catalogue of Indian movies available anywhere on a single platform. Though over the last few years a number of online platforms have come up that streams Indian movies online, either for free or on a fix fee subscription model. They decided to find out how these dedicated platforms compare with YouTube and came across some interesting numbers. 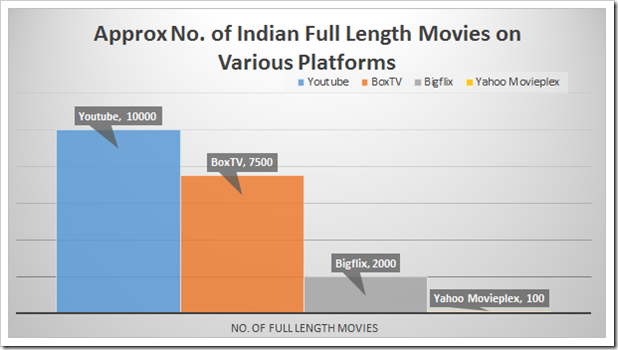 They tried to compare Times Internet backed BoxTV.com, BigFlix.com and Yahoo movieplex with YouTube. While Youtube has over 10,000, BoxTv also seems to have good number of movies on their catalogue. However, BoxTv did not mention the number of movies they have. Therefore, some specific search strings in Google search were used but it only showed up on actual full movie pages. The search results showed that BoxTv has over 7500 full length movies, which is not bad for a platform that has been recently launched. BigFlix has over 2000+ full length movie available on their platform according to their website. Yahoo Movieplex hardly had any Hindi movies. We don’t think Yahoo is too serious anyway. Most YouTube movies are completely free of cost, whereas on BoxTv and Bigflix, they are available on subscription model. Rajan Anandan, in the interview shared some other numbers as well. He opines, “YouTube has gone from 15 million unique users in 2011 to 55 million unique users a month in 2013. Apart from 10,000 full length Indian movies, they have 95% of India’s music catalogue both in Hindi as well as in regional languages. It can be easily made out that YouTube is progressing to become a near monopoly in Indian web video content market. Seeing its rapid popularity, it is sure to be nearly impossible for any one else to even come remotely close to them in the near future. What are your thoughts on this? We would definitely love to hear from you. Do leave us your comments on this.